Regular readers of this blog know that I was the Director of Manufacturing, and later Sales Manager at Weldcraft so it was natural for Arc-Zone to sell Weldcraft TIG Welding torches. It was also natural for us to sell torches from CK Worldwide–another top quality manufacturer. CK has a long history of developing TIG welding torches for the aerospace industry in the Pacific Northwest. 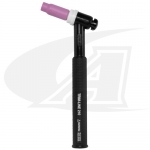 They manufacture a wide variety of torches and over the years they’ve developed some really innovative products, including some torches to solve some common problems. The Flex-Loc gives you the versatility of a flexible head torch without the downside—you can only bend them so many times before they break. And there’s no fix; you have to buy a whole new torch when it does. 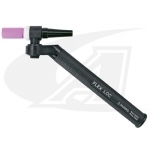 The Flex-Loc, however, is a modular design with an indestructible hard plastic molded torch body and rubber molded torch heads. The real beauty is that the head rotates into different positions and you can lock it into place after selected your desired head angle/location. We offer CK’s air-cooled 150-amp Flex-Loc TIG torch and the water-cooled 230-amp and 250-amp water cooled Flex-Loc torch. The Contractor Series is a rugged torch great for pipe work, oil and gas work, or any welding in the shop, or in the field. This torch is engineered for working in a tough environments. It has a stainless steel (rather than the traditional copper) head that you can’t strip out. The Contractor Series torch also has a built-in twist (left to right) gas valve instead of a screw-in valve stem. The gas valve is integrated—built in so there are no parts to lose. And if you lose a gas valve stem or strip out the threads out of your TIG torch head– you’re not making money while your search for replacements parts! The Contractor Series TIG torch is available as 150-amp air-cooled torch. While the Trimline Series only has two options, a 200 amp air-cooled torch and a 350 amp water-cooled torch, they are both great for heavy-duty applications, but without the heft and the bulky handles of similar amperage torches. The Trimline is more compact, about 30% smaller and lighter so it’s more comfortable to use, but has all the power you’ll need. In addition to these specialty torches, Arc-Zone carries the world’s most complete line of CK Worldwide TIG Torches and replacement parts, CK TurboSharp Tungsten Grinder, and CK’s tungsten electrodes. We also stock the GasSaver and wedge collets engineered to optimize your TIG torch set up and help you do better quality welds, while putting some cash in your pocket! I am looking for a twist gas valve flex head 200amp tig torch. Do y’all make that.